Placenta pills are a form of Traditional Chinese Medicine which can have a dramatic and beneficial effect on a new mother's milk production, hormonal and emotional stability, and physical recovery from birth. Placenta Encapsulation is completed within the first 5-7 days after birth. I will pick up the placenta from your place of birth (home, birth center or hospital) the day of or day after birth, and will return the pills to you in your home as soon as they are ready. The processing occurs in my own home, within the strictest of hygiene and safety standards. The steps are outlined below with photos, but for those that would prefer the information without the images, they are: steaming the placenta with ginger and lemon, then drying it at a low heat in order to preserve the many beneficial nutrients and hormones it contains. 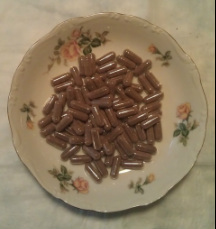 Once dried, it is ground to a fine powder and placed into capsules; a typical placenta may yield 75-100 pills. Please contact me if you have any questions and/or if you would like to book a placenta encapsulation. I look forward to hearing from you! Before processing the placenta, I examine it thoroughly to be sure that both it and the membranes were birthed completely, and to learn what I may about the placenta's, mother's and baby's health. 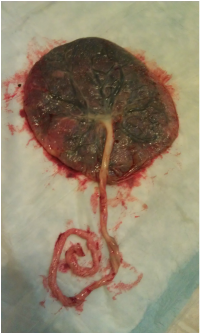 What you see here is the maternal side of the placenta, with blood vessels running through the surface and the umbilical cord stemming from the center and curled into a spiral. People refer to this side as the "Tree of Life", as the cord, vessels and placenta can form the shape of a beautiful tree. Prints of this tree are available upon request. What you see here is the fetal side of the placenta, connected to the umbilical cord which is wrapped up inside. The maternal side of the placenta is down against the pad it rests on. I am holding up the amniotic sac (also referred to as membranes), to make sure that it is complete, and to visualize where the baby lived for it's time in the womb. 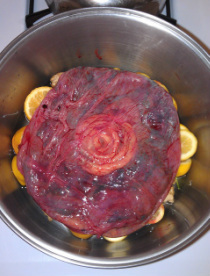 A placenta ready to begin the steaming process. Below the placenta is an abundant layer of fresh organic ginger and lemon. Underneath the shiny membranes I've wrapped over the top, you can see the umbilical cord spiraled and snugged into the placenta. After it has been steamed, I slice the placenta into thin strips and dry it at a very low temperature for a full day. This process allows it to become shelf stable (like beef jerky, for lack of a better comparison), while preserving the hormones, nutrients and other qualities that make it such potent medicine. Once it has dried sufficiently, I grind it into a fine powder and place it into capsules, as you can see here. For the final step, your placenta pills will be placed in a personalized bottle. The umbilical cord, which was dried with the placenta, is placed in it's own bag, as a keepsake that may be passed on, kept, or buried under a tree as the client wishes. These will be delivered as soon as they are complete, with instructions, and with time allowed for any questions you may have to be answered. I will remain available for consultation if any questions arise in the weeks to come, and enjoy hearing feedback as clients learn what benefits their placenta pills give to them, and how to find the right dosing and balance for their personal postpartum recovery process.